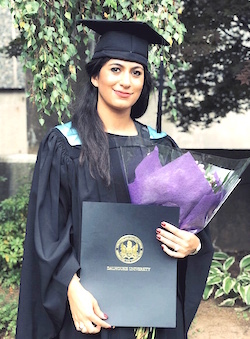 Although Neda Ghaferi had contemplated an MBA ever since earning her undergraduate degree from Dalhousie, she decided to pursue work experience first. But three years into a managerial role in the French as a Second Language department at Université Sainte-Anne (Nova Scotia’s only francophone university), she was ready to find a program that would boost her education. Today, Ghaferi is a proud graduate of Dalhousie’s Master of Business Administration – Leadership program. She’s also been promoted to a new role as Sainte-Anne’s Halifax campus director. By the time she started researching MBA programs, Ghaferi had realized there were particular skills she wanted to develop as a manager. “I had reached a stage of my career where I was limited with strategies and managerial skills that would help me lead within the complex contexts at work,” she says. “I wanted to improve my work, expand my skills and get more responsibility. At the same time, I wanted to make sure that I had all the knowledge that may be required when you get to a higher level,” she recalls. Ghaferi reached back to her alma mater and found the new program—a blended offering with 10 core MBA courses plus four leadership courses—offered her the flexibility to learn online but also to make personal connections through the three- to four-day in-person intensives at the end of each course. “The fact that I had the option of managing my own study time meant that I could handle both my professional and personal life load,” she says, adding that reading the course titles made her realize the program was for her. The intensives were one of her favourite parts of the program. “During the intensives, everyone wanted to talk. Everyone had something they wanted to share and that made the interaction with peers valuable,” she recalls, noting that she met people from many sectors, from banking to the military to industries, mostly managers like herself. “It introduces you to people who are going through the same challenges and it shows that you are not the only one dealing with that complexity,” she says, adding that even during the program the cohort would reach out to each other for recommendations and advice. “I learned a lot from the experiences that other people had,” she says.